Arts advocates have been pounding the drums to add an "A" to STEM - that's Arts to Science, Technology, Engineering and Math - for years now; I've written about it on this very blog (and on other blogs!) It seems that STEAM is now picking up, er, steam: the Wall Street Journal published an article describing STEAM's emerging prominence across the education sector*, from a bipartisan STEAM caucus in Congress to the New York City public schools to Stanford University to Sesame Street. "It's about giving the arts the proper significance," said Rosemarie Truglio, senior vice president for global education and research at Sesame Workshop (which produces Sesame Street. "We're very proud that we have a STEAM curriculum and it's integrated—it's not an add-on." In other STEAM news, science news service Phys.org has an interview with Jay Young, a former math teacher, University of Houston College of Education Ph.D. student, and STEAM advocate. Young is currently researching an after-school program that utilizes STEAM. "Creative thinking and problem solving are essential in the practice of math and science," he said. "Incorporating art into math and science will not only help students become more creative and better problem solvers, it will help them understand math and science better." Meanwhile, as STEAM continues to build support, a possible humanities crisis is brewing. The New York Times reported on sharp declines in humanities majors in recent years and the fact that some students are choosing sciences over the humanities for their major. More worryingly, the staff of the Harvard Crimson published an editorial celebrating the decline of the humanities in favor of STEM subjects. I won't go into debunking the editorial here other than to say that the authors, while arguing for the demise of the humanities, have ironically proved we need the humanities more than ever. While the decline in interest in humanities subjects is troubling, I think the recent uptick in both interest in and adoption of STEAM shows great promise for both the arts and the sciences. STEAM shows that it doesn't have to be either-or with the arts and sciences; the two compliment each other quite well. Nowhere was this more clear to me than at an exhibition I recently saw at the Museum of Arts and Design. Out of Hand: Materializing the Postdigital surveys how artists, designers, and architects are utilizing cutting-edge technologies such as 3-D printing in their creations. From prosthetic limbs to jewelry based on complex mathematical theories to sculptures by Frank Stella and Roxy Paine, none of the objects in the exhibition would have been possible without a synthesis of art and science. If what I saw at MAD is any indication, the future of STEAM is very bright indeed. This blog will remain live as an advocacy resource. I highly recommend you check out Curator's Corner and School Arts Room, which are both updated regularly and have terrific content whether you are an art teacher, an artist, an art historian, an advocate, or just a lover of art and art history. And for continued advocacy news, I recommend keeping up with Createquity and ARTSblog, and subscribing to daily art news digest You've Cott Mail. For now, adieu, and keep advocating! Art Room Still Life by Alexa Clark. Image via Flickr, courtesy of Alexa Clark. What inspired you to become an art teacher? The New York Times will soon publish a piece by Holland Cotter on his his path to becoming an esteemed art critic for the Grey Lady. The paper has put out a call for stories from visual arts professionals of all stripes on how you came to your career. They want to hear from you whether you are an art teacher, a museum security guard, a photographer, a painter. Though my family was more than supportive of my choice to pursue a career in the arts, others have faced seemingly insurmountable odds to pursue their passion in this field. That is one reason that the arts are a great place to work. You may become a banker just for the money, but if you're in the arts, it's more than likely that you are in the field for the love of it. I can't wait to see what The Times publishes for this feature, and maybe even one story will demonstrate to a budding artist or curator (or art teacher) that their dream is not so crazy after all, and a dream worth pursuing. 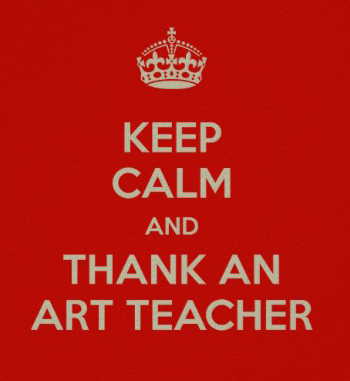 Happy (Art) Teacher Appreciation Week! Happy Teacher Appreciation Week! Of course every week should be Teacher Appreciation Week (and especially Art Teacher Appreciation Week), but why not pick one to celebrate and give everyone the warm-and-fuzzies? 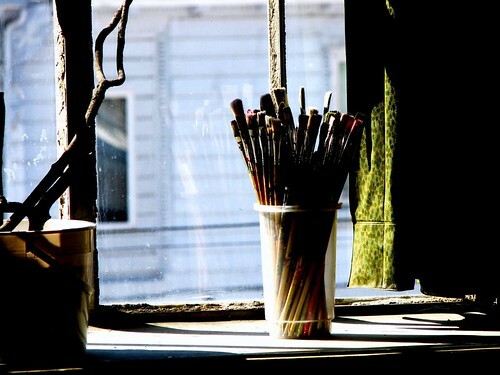 Following are some inspiring stories that may make you want to run and hug the closest art teacher. Finally, I recommend checking out this Kickstarter project from a New Jersey art teacher trying to reach the Arctic Circle for a unique expedition this fall. Laura Petrovich-Cheney has been accepted to a residency program in the Svalbard archipelago, between Norway and the North Pole. Her mission in attending this residency is to integrate her experience there into her elementary art teaching classes, where many of her students are disadvantaged. Petrovich-Cheney is obviously lucky to have this opportunity in the first place but the project demonstrates a devotion to her students and an interesting perspective on integrating environmental issues into the art classroom. I hope she reaches her goal! Oobleck! This weird gooey stuff is the centerpiece of the Brooklyn Museum of Art and Science's first pop-up, coming this Saturday. Image by Flickr user Mrs. Dr. The Ivan. A few months ago I posted a tidbit about a proposal for an art and science museum in North Brooklyn (my home!) - and it was very popular with you, my loyal readers! I'm happy to say that it looks like this exciting proposal is moving forward. Meredith Hoffman of DNAinfo reports that a planning group has identified sources of funding and created a plan for a 100,000 square foot center, deemed the Brooklyn Museum of Science and Art. "It's not just a science or art museum," according to architect Darrick Borowski, "and it's not just crafty exhibits for kids explaining science. 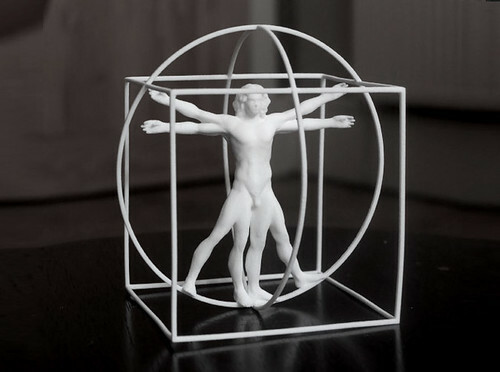 It's scientists and artists coming up with ideas and exploring issues together." Borowski also notes that the North Brooklyn neighborhood of Greenpoint, where the museum will be located, is a great location due to the number of families as well as artists and creative workers. An exact place for the museum has not been identified yet, and it likely would not open until 2019 - but in the meantime planners will host pop-up events in the community. The first event is coming up this Saturday, May 11, in Brooklyn's McCarren Park. As part of the evironmental festival Go Green Greenpoint, a pool of oobleck - a material that is both solid and liquid, made of water and cornstarch - will be placed in McCarren's playground, so visitors can experience "walking on water." Oobleck papier mache activities will also be on-site for the art component. For more updates on the Brooklyn Museum of Science and Art, check out their Facebook page! I'm looking forward to watching this project take shape right in my own neighborhood. 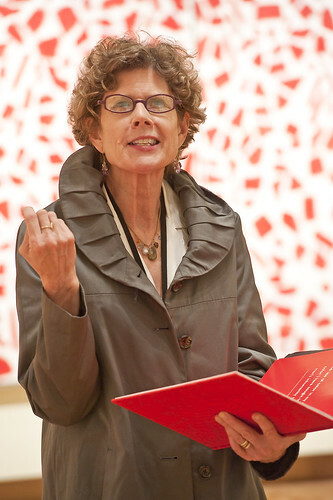 A docent discusses a work by Alma Thomas (behind) at the Nasher Museum of Art at Duke University. Photo courtesy of the Nasher Museum of Art Flickr. Happy nearly spring! Most of us "sprung forward" this weekend, meaning we'll be out of the winter doldrums soon (though I know my colleagues this blog's sponsor, Davis Publications, may not feel that way, having received almost two feet of snow a few days ago. Sorry guys.) In honor of the most hopeful time of year, here are several uplifting stories that will make arts advocates smile. Last November the city of Portland, OR voted to implement an arts tax to support art education in their city. The tax has now gone into effect; it will collect a total of over $12 million a year that will go to art teacher salaries and nonprofits supporting arts education. The tax will cost Portlanders $35 per year - not much considering all the benefits of arts education. Bravo, Portland - this investment in your future will pay significant dividends for years go come. I hope other cities will follow suit! By the way, I'm not the only one who is a fan of Alma Thomas. In 2009 the Obamas selected two paintings by Alma Thomas to hang in the White House during there residence at our nation's most famous address. This New York Times piece from 2009 has more information on Thomas' trajectory from art teacher to famous artist, as well as images of other works the Obamas selected to hang in the White House. Finally, a friendly reminder that Arts Advocacy Day is coming! April 8-9 arts advocates will descend on DC to speak up for the arts in the halls of Congress. Cellist Yo-Yo Ma is giving the Nancy Hanks Lecture on April 8. Ma is a member of the Presidents' Committee on the Arts and Humanities, a public-private coalition that seeks to advance the arts nationally; he is participating in the Committee's Turnaround Arts initiative that uses the arts as a tool to transform schools in need. We in the arts...have the great and good gift of dealing with beauty, with joy and hope...We do this in a world that is sometimes unimaginably ugly. What can we now do? Nothing more than to keep doing what we do; to continue to be part of what makes life good, what makes it worthwhile, what gives hope and joy and brings smiles to faces. I highly recommend The Further Erosion of American Innocence from Barry's Blog His beautiful and thoughtful post on what the arts can do in the wake of a tragedy like the shooting at Sandy Hook was moving and even comforting. 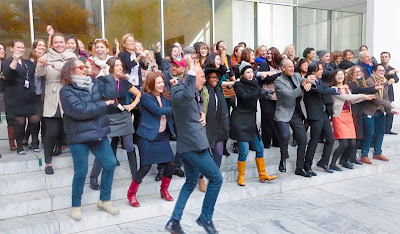 MoMA Staff go Gangnam Style in support of Chinese activist artist Ai Weiwei. Happy Thanksgiving everyone! Before your tryptophan-induced food coma sets in here are a few arts and advocacy links, from kids' artistic interpretations of the news to art world Gangnam Style. If you keep up with art world news you may know about the plight of artist Ai Weiwei, an outspoken critic of the Chinese government's track record on human rights. Ai recently produced a video parody of Gangnam Style, the song by Korean pop star Psy that is currently taking over the world. Chiense authorities promptly removed the video from the internet, and now English sculptor Anish Kapoor is calling on the art world to create their own Gangnam Style videos in support of Ai and free speech. Some US museums, such as MoMA, Philadelphia Museum of Art, and LACMA have made videos as part of the campaign. "It had to be done," said Kapoor. "Yes, it is desperately silly, but what is the paradigm of the artist? The artist does stupid things with serious intent." You know what my feelings are on humor in advocacy, so of course I love this idea! I recently found out about Kids Draw the News and thought you might interested in this fun project coordinated by the New York Times' City Room blog. Every so often City Room will put out a call for drawings of a specific current event. Past topics have included Hurricane Sandy, traffic school for cyclists, and my personal favorite, Mitik the baby walrus (who recently arrived in my home borough of Brooklyn). The feature is open to kids under 12 and you don't have to be from the New York area to submit. It's fascinating see how kids interpret each news story - it demonstrates how art develops critical thinking and analytical skills. And many of the drawings are an absolute hoot. The Arts Council of Great New Haven has a new program called "Reintegrate" that will grant $10,000 each to seven teams of artists and scientists based in Connecticut. The goal of the program is innovation through the synthesis of art and science - one of my favorite topics! Read more about some of the fascinating proposals at the Yale Daily News.